I am back from Albuquerque! Had an amazing visit! Such a fun show at the Stranger Factory and then a great time on my birthday doing some hiking, etc. as well. Just a short and important update today. Firstly and time-sensitive - I debuted four paintings (shown above) at the show on Friday. The gallery always lets locals & attendees have first dibs through Monday for new works. I know for certain "Milagros: La Luna" (second from the left with the blue moon) was SOLD in person during the show on Friday. However, the others may (or may not be, it has not been updated) available at NOON today (Pacific time) to the rest of the world! All details, titles, pricing, installment/deposit policies, full sized photos, etc. are HERE. If you are interested in purchasing any of these originals (the gallery will ship worldwide) the availability will open up to the general public today (June 6) at 12 Noon Pacific Time. Email strangerfactorysales@gmail.com When emailing please include the title/ price and artist name of each piece you are interested in. Titles, sizes, prices and details are HERE. If you are interested in several pieces, please put them in order of priority. ***Please specify if you would like to purchase more than one piece. Secondly - prints! I will be releasing prints (glossy paper prints signed on the back from me for $9.99 ) and limited edition canvas prints ($100, hand embelished by me in acrylic paints, etc.) for all of these new paintings over the next week or two at Strangeling.com . Today I have released the first one - "Milagros: La Luna" - prints are now on sale worldwide here. The original has been SOLD, more details on the prints are below! Prints & limited edition canvases from $9.99 are here- we ship worldwide. We'll ship anywhere on the planet! Original painting SOLD at the show at Stranger Factory gallery in Albuquerque on Friday, but hey - at least we have prints =) If you are in Albuquerque, visit the gallery and see these all in person - they'll be hanging for the next several weeks! My Milagros series is Inspired by the wonderful milagros charms on a lot of the folk art I saw in Mexico earlier this year. “La Luna” is the Spanish word for “The Moon” which features prominently in this painting. 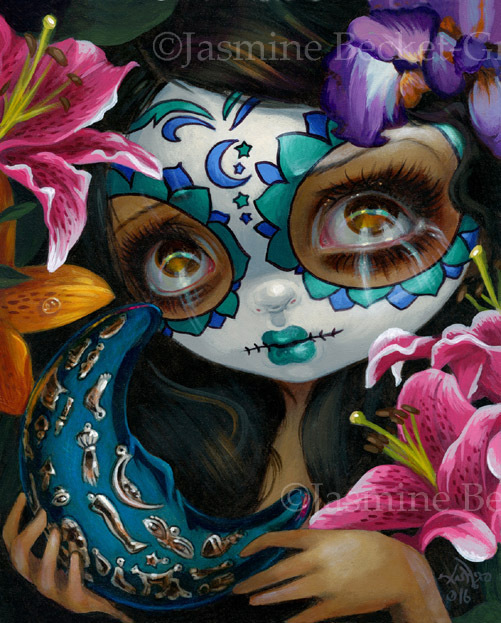 I painted this piece for Stranger Factory gallery in Albuquerque, New Mexico (a great city to find milagros charms and lots of Mexican folk art!) – this lovely girl has several beautiful charms adorning the heart, and she has some traditional Calavera face paint on. Milagros charms are typically tied with a person’s name, with the shape of the charm indicative of the healing/prayer wanted (ie a leg, if somebody is praying for their leg to be healed, etc.). They are often used as decorations sewn to clothing, glued to crosses, left at shrines, worn as jewelry, etc., I have many milagros hanging in my studio. The original painting sold at the art show, but we have prints & canvases available now up at Strangeling.com . This is the third installment in my series of pieces featuring Milagros. Also be sure to check out the Hamilton Collection for my series of related figurines inspired by the Day of the Dead, Sugar Skulls, etc.! From upper left corner, clockwise: "Milagros: La Calavera," "Milagros: La Luna," "Ossuary: The Serpents," and finally in the lower left corner "Ossuary: The Bouquet." Each is priced at $2400 each, is an original acrylic painting on 8x10" panel, and are in glossy black ornate frames measuring 10x13". If you are interested in any of the originals, come to the event and/or email them at strangerfactorysales@gmail.com- the gallery can ship worldwide. The gallery always lets locals & attendees have first dibs through Monday until noon for new works. I know for certain "Milagros: La Luna" (upper right with the moon) was SOLD in person during the show on Friday. However, the others may (or may not be, it has not been updated) available at NOON today (Pacific time) to the rest of the world! All details, titles, pricing, installment/deposit policies, full sized photos, etc. are HERE. 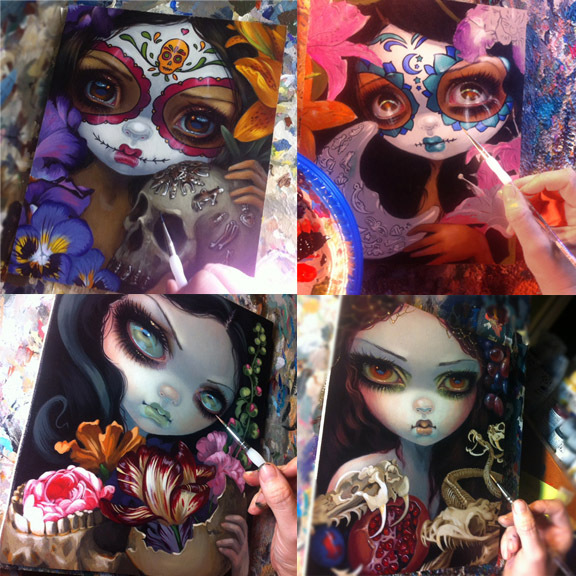 If you are interested in purchasing any of these originals (the gallery will ship worldwide) the availability will open up to the general public today (June 6) at 12 Noon Pacific Time. Email strangerfactorysales@gmail.com When emailing please include the title/ price and artist name of each piece you are interested in. Titles, sizes, prices and details are HERE. If you are interested in several pieces, please put them in order of priority. ***Please specify if you would like to purchase more than one piece. Prints & limited edition canvases of the new paintings will be available at Strangeling.com in the next week or so!